From some of the comments on this reading order thread, I expected Earth 2: World's End Vol. 1 to be a troubled outing, as DC Comics's weekly offerings are sometimes troubled. 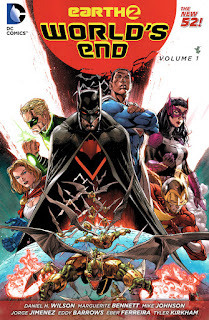 But riding well the momentum from Tom Taylor's most recent (chronologically) Earth 2 volume, Daniel H. Wilson, Marguerite Bennett, and Mike Johnson tell a fine story with the expansive Earth 2 cast. The book is not perfect, bowing under its own weight toward the end, but there's a big tapestry and enjoyable characters -- not to mention New Gods -- and the scope lends itself perfectly to a weekly-sized tale. I'll complain at the start about some continuity issues in World's End. I am not one to worry about the invalidation of something a hundred issues back, but with only twenty-six issues each of Earth 2 and Worlds' Finest preceding, there's not that much to study. And I do think that the first issue suggestion that Catwoman Selina Kyle was killed by Parademons and not a drug bust gone bad -- as established in Worlds' Finest -- comes from poor research on the part of writers or editor. Meanwhile, I'm more forgiving of Wilson and company recasting the death of Sam Zhao, Alan Scott's boyfriend, to fit with World's End's new villains, but some of this, too (like Sam intending to propose before Alan) seems unnecessary retroactive continuity when surely there was a way to tell the same story while building on what actually came before. What I liked here, again, is that Wilson and company have a large tapestry, telling their story with a very large cast. That's always been a boon of Earth 2 since back in the James Robinson days, but for both Robinson and Taylor, juggling that cast in twelve issues a year means someone always takes a backseat. The weekly format is better for Earth 2, packing more story into a small space, and the writers juggle well Green Lantern and Grundy; Hawkgirl, Flash, and Dr. Fate; the World Army, including Mr. Terrific, Mr. Miracle, and Big Barda; Darkseid's various minions; and the "new World's Finest" of Superman Val-Zod, Red Tornado Lois Lane, Batman Thomas Wayne, Huntress, and Power Girl. Stories weave in and out, as one expects a weekly series to do; there's a bit of repetition here, but even that has an episodic feel to it like a weekly TV show. I never felt like one of the writers' voices came through stronger than any others; perhaps it's because I'm less familiar with Wilson, Bennett, and Johnson, but the writers in Futures End were distractingly noticeable, while not so much here. The writing also feels of a piece with Tom Taylor's Earth 2; Taylor and Robinson didn't transition as smoothly (Robinson having a noticeable writing voice kind of like Aaron Sorkin), but in essence I can go from Earth 2 now to World's End and not know the difference. And there's plenty of "finally" moments throughout, pent up from twenty-six issues of the companion series, not the least of which is the reunion of Power Girl and Lois. The first volume of World's End does fall apart a bit toward the end (which is maybe a bad sign, since it's only the end of this volume, not the series). There's a spate of "page filling," like for instance a page or so of Power Girl and crew flying at some attacking robots. In one scene the Earth 2 Barbara Gordon appears to have been blown up, and then in another she's just fine, jumping up on a train. As well, the politics of Apokolips's weird ruling council are never quite clear -- this is their first appearance, as far as I know; equally I have no idea why Darkseid is ultimately imprisoned in Apokolips such that he needs Mr. Miracle to free him. It's also unclear until the very end when this all takes place in Miracle's personal timeline; since Scott Free has escaped Apokolips, I just assumed he already knew his true parentage (Orion seems to know the same over in Wonder Woman), and so his confusion bleeds into the reader's confusion. In the end, Highfather has apparently made some deal to sacrifice Earth 2, but we don't know when that takes place vis a vis the events of "Godhead" over in Green Lantern. And Barda betrays Miracle here, which doesn't match their relationship in Futures End (I don't think), though perhaps that's explained away by Futures End's own finale. But again, some bad press perhaps did Earth 2: World's End Vol. 1 well. The book is not seamless, but what I've enjoyed of Earth 2 I continued to enjoy here, and maybe a bad rap made me go in more charitably. All of this gives me hope for Earth 2: Society after Convergence, and I'm glad to see Earth 2 sticking around for "Rebirth" after that. I'm glad Collected Editions liked this. Okay, I'm new to reading the New 52 Earth 2 books, but how can I forgive the fact that Alan Scott was proposing to Sam on the train in Volume 1, but in that supposed same continuity of Earth 2: World's End Alan Scott seemed surprised that Sam was the one supposedly about to propose? I'm not sure why you would forgive this more than any other continuity error, to be honest. I found this to be unacceptable, and it's a shame that I cannot unread something. My review of World's End Vol. 2 is not so much.